Greetings again from the darkness. United States citizens are living in a culture of addiction. That’s the key message that director Chris Bell and his co-directors Josh Alexander (also the film’s writer) and Greg Young wish to get across. 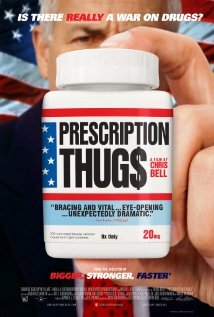 Of course, this one’s not about cocaine or heroin, but rather the more rampant societal problem of overmedication via prescription drugs. It’s not really a revelation or shock-inducing theme, but it’s certainly a worthy and important topic. The movie begins with Chris Bell introducing himself and reminding us of his first movie, the well received documentary Bigger Stronger Faster (2008). In that one, he focused on the use of steroids and Performance Enhancing Drugs (PED’s) throughout competitive bodybuilding – including him and his brother. Bell connects the two docs by explaining that the steroids lead to pain killers and other prescription drugs … legal drugs prescribed by doctors. To the detriment of the message, he chooses to focus on this for an extended period by speaking with WWE wrestlers, MMA fighters and by explaining that he believes the drugs are at least partially responsible for the death of his brother, known in the wrestling world as Mike “Mad Dog” Bell. It’s this overly-personalized approach that limits the film’s effectiveness. Chris Bell takes the Michael Moore/Morgan Spurlock approach by putting himself smack dab in the middle of most every segment, and even using cutesy sidebars like animation and a Scarface clip. The result is a somewhat amateurish look and feel to a topic that deserves better. In case there are doubters, Bell provides some startling statistics … the U.S. is 5% of the world’s population, but consumes 75% of the prescription drugs. One in ten American adults are on antidepressants. Keep that last statistic in mind the next time you stroll through your office, church or the neighborhood shopping mall. Bell devotes time to “Big Pharma” and its army of lobbyists. He takes us back to the deregulation initiatives of the 1980’s which kicked off what has become the onslaught of “ask your doctor” TV ads that permeate the airwaves. The implied message is simple: if your doctor says the drug is OK, then it must be safe and effective. Our society is being marketed right into addiction. Oxycontin, Vicodin, and Codeine are all part of the Opiate family … the same as heroin. The reality is that the business of prescription drugs has evolved into a money-printing industry. Profits are the goal, which is why treatment is emphasized over cure. An addicted patient is profitable patient, and in a best case scenario for Big Pharma, the side effects of one drug lead that patient right into another drug … sometimes both are produced by the same pharmaceutical manufacturer! The second half of the film is structured significantly better than the first, and includes what is the most impactful sequence. Bell visits with California Congressman Ted Lieu, who is jolted into action when he is sees that Oxy is readily available on Craigslist. This section also leads to a not-so-surprising confession from Bell – a confession that helps explain why he is so intent on being the center of the movie. A key point that is mentioned, but underplayed, is the admission by a doctor that an entire generation of medical school graduates has been taught that there is no downside to prescribing whatever level of pain medication is required for a patient, and even more frightening is the concern that doctors are being misled by drug companies in regards to efficacy and side effects. It’s another link in the seemingly unbreakable chain that doesn’t address the underlying issue. This entry was posted on Thursday, January 21st, 2016 at 11:19 pm and is filed under Documentary. You can follow any responses to this entry through the RSS 2.0 feed. You can leave a response, or trackback from your own site.